Will U.S.-Vietnam Ties Benefit From the Trump-Kim Summit in Hanoi? U.S. Secretary of State Mike Pompeo, left, meets with Vietnamese Deputy Prime Minister and Foreign Minister Pham Binh Minh, right, at the Ministry of Foreign Affairs in Hanoi, Vietnam, July 9, 2018 (AP photo by Andrew Harnik). 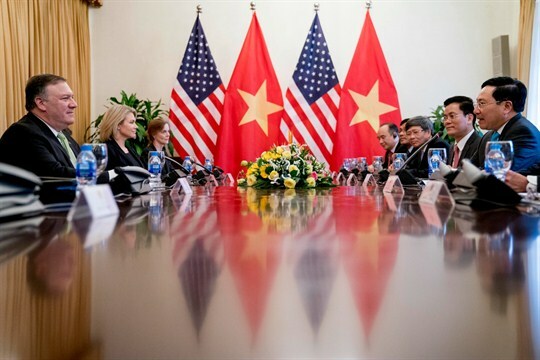 Hanoi’s role as host of the second summit between U.S. President Donald Trump and North Korean leader Kim Jong Un put U.S.-Vietnam ties in the spotlight. Over the past decade, Hanoi and Washington have succeeded in putting the bitter memories of the Vietnam War behind them to forge a mutually beneficial relationship. But the jolt of Trump’s withdrawal from the Trans-Pacific Partnership early in his term and several potential irritants could complicate efforts to develop even closer ties. In an email interview, Carlyle A. Thayer, emeritus professor at the University of New South Wales, Canberra, explains the impact of the TPP withdrawal on bilateral relations, the factors driving and impeding closer ties, and the potential obstacles moving forward.